Sing, E.T., and a special Looney Tunes presentation in our April Family Favourites! Bugs and Elmer supply new lyrics to Rossini's opera. The final installment of the "Hunting Trilogy" once again has Elmer out hunting, while Bugs and Daffy try to con him into shooting the other. Daffy Duck: Awfully unsporting of me, I know, but what the hey, I gotta have some fun. And besides, it's really duck season. Q: Is it really rabbit season? Q: What music is playing when Elmer walks Daffy to his cabin? The four signs on the road say "If You're Looking For Fun.....You Don't Need A Reason....All You Need Is A Gun....It's Rabbit Season!" In the woods, we see hundreds of "Rabbit Season" signs posted on every tree. We see more and more signs pointing exactly to Bugs Bunny's hole. Who's putting up all these signs? Daffy Duck! Daffy puts the last sign up, tiptoes away and says to us, the audience, "Awfully unsporting of me, I know. But, what the hey - I gotta have some fun! Besides, it's really duck season." 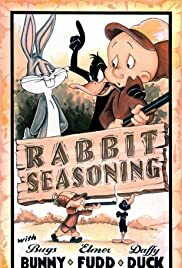 From that point, we now see Elmer Fudd, shotgun in hand.....and a war of semantics between Bugs and Daffy with Bugs winning every time. Only in cartoons, thankfully, can we see someone getting shotgun-blasted in the head five times and keep going!